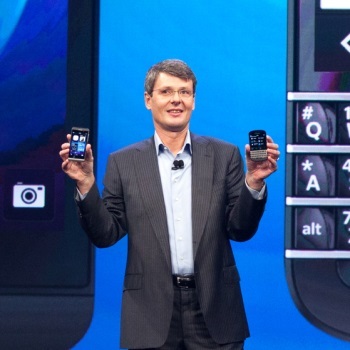 The recent layoffs aren't going to stop BlackBerry from going broke. BlackBerry may be about to go private. A Canadian firm and some other buyers have scraped together the $4.7 billion needed to acquire the company, at $9 per share, but the deal's not finalized yet. Theoretically someone else could step in with a better offer, but at this late stage the phone maker hasn't got too many other suitors in the wings. It's gotten to the point that it even had to sell off all its corporate jets - including a new Bombardier bought only two months ago to replace its existing air fleet - thanks to what a BlackBerry spokesman describes as "the company's current business condition." Its current business condition recently forced it to lay off over 4,500 employees, after losing almost $1 billion in the second quarter 2013. Analysts at RBC Capital Markets claim the layoffs aren't going to be enough to stop the company running out of cash inside of two years, as BlackBerry is hemorrhaging capital and its patents are worth less and less with each passing day. The patents are the real stinger, since any buyer is going to be primarily interested in the value of its intellectual property; no value, no buyers. Other analysts are even less sanguine. "We expect BlackBerry will soon go away as a handset brand and likely as a smartphone operating system too," claims Michael Genovese, of MKM Partners. "The brand may only remain as part of the standalone BlackBerry Messenger application before long." Genovese estimates the share value at $7 per, considerably less than the projected buyout price, with the intellectual property making up $1 of that $7. The current buyer is going through BlackBerry's financials with a fine tooth comb, and will finish the due diligence process by early November. Then BlackBerry will know if it has a deal on the table, or not. If not, given the company's dire situation, it seems likely more layoffs - at the very least - will follow.